The world has been praying for Paris since Friday. Everywhere I go on social media Paris is trending and it seems as though everyone is closely following what is happening there like a close call on a football match. I stand with Paris and have thought so much about those who have lost their lives for no reason other than someone’s selfish desire to impact pain. On Facebook people are changing their profile picture to show their support. This has sparked a debate, with some saying that Facebook never had the same for other countries which have witnessed great terror attacks and what should bring out our humanity is bringing out our lack of it. 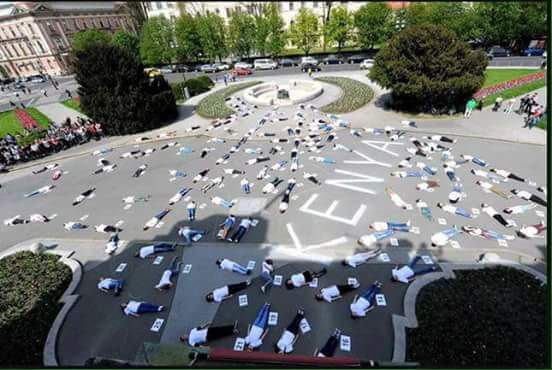 But, I remember two attacks in Kenya: Westgate Mall attack and Garrissa University. We lost so many lives and those who lived cannot tell the tale because the horror of it makes it hard for them to look at faces or shake hands of people. So, why should we argue about who gets special treatment or any kind of treatment while people have died and others are injured? Why argue as our fellow human beings our brothers and sisters are grieving? Why argue when the one who is hurting needs to be reminded that there is hope and love and good people in the world? Terrorists instill fear, and they shred every single ray of hope you have not in the world but in people. You ask, how can someone kill people who have done him no wrong? How can someone blow up kids and mosques and churches? They shred your hope in your fellow human being and if you let them convince you then you realize that life is not worth living for you are but ONE in SEVEN BILLION. But, I have also witnessed disregard for black people and also for Muslims. I have seen my friend forced to take off her hijab to enter a mall while I am told I can go in, and when I left with her I was insulted by the guard. I have heard from friends and family living abroad how much they have been sneered at, insulted or treated badly just for being black. It’s not right. I did not want to sit back and let the world rip each other over social media because Paris has this special thing where you can change your profile picture to show your support. But most of all I pray for you and I not because prayer is the only option but because we can pray all we want but unless we work on ourselves then it’s as good as nothing. I pray for you and I that we will be better human beings by truly working on our character, principles and morals.